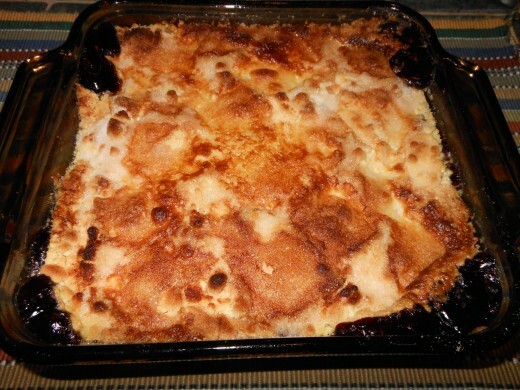 Baking an apple dump cake is easy and inexpensive. This dessert takes less than 5 minutes to prepare and only needs about 25 minutes to bake. 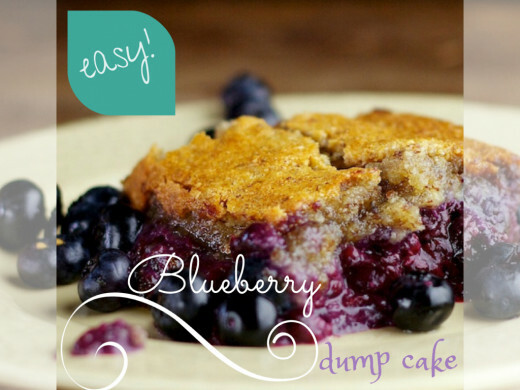 Dump cakes are a fun and easy dessert. You can prepare a dump cake in just over 25 minutes. 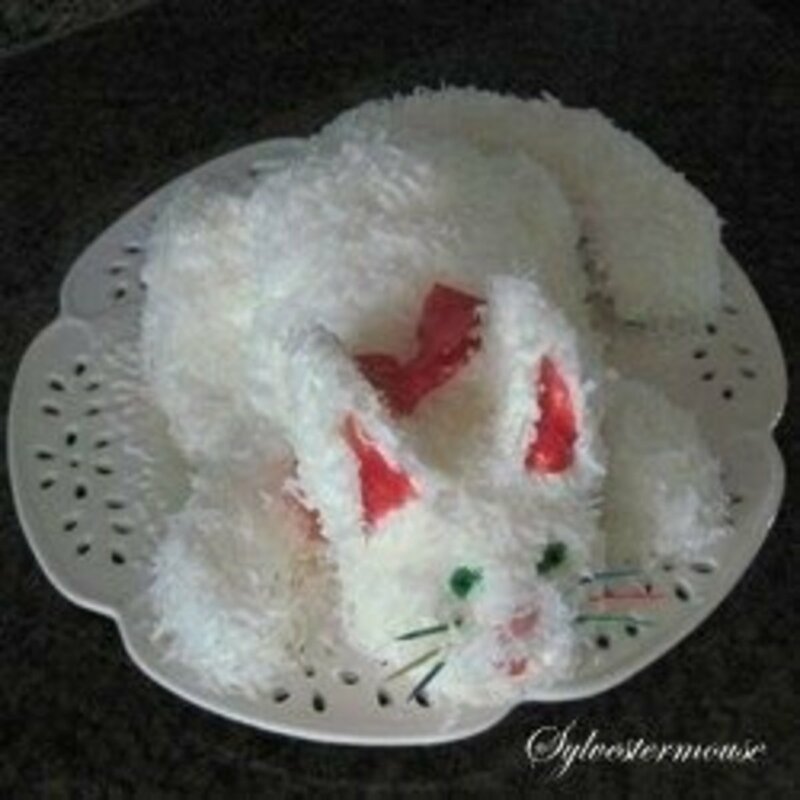 This recipe is easy for kids to make too. You simply dump the ingredients in, bake and you're done! Just follow the easy recipe directions below. Either read along or just follow the picture tutorial. 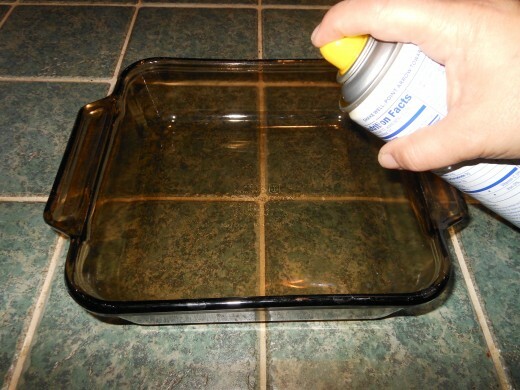 Spray inside of baking dish with butter flavored cooking spray. 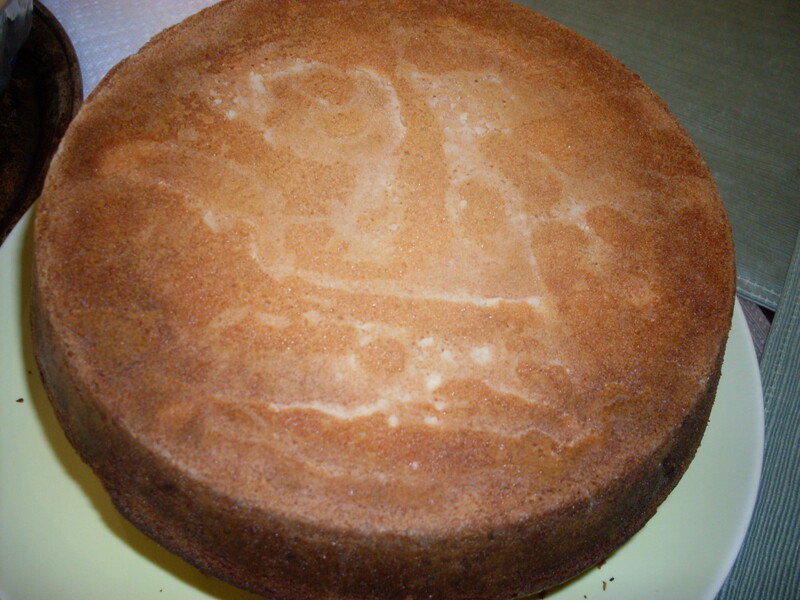 Be sure to evenly spray the bottom and sides of the baking dish. Pour the two 21oz. 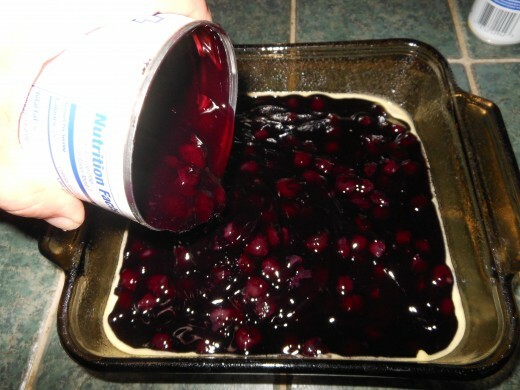 cans of blueberry pie filling into the baking dish. Spread evenly. 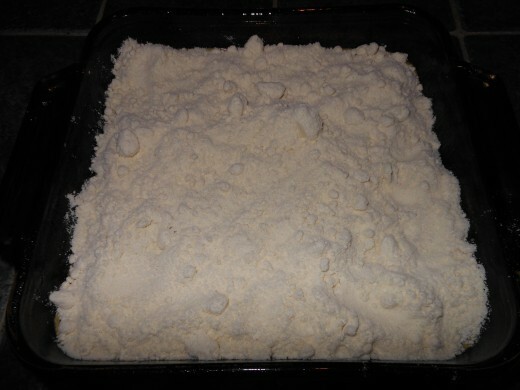 Evenly sprinkle half a carton of dry yellow cake mix over the pie filling. Smooth over the filling with the back of a spoon. Taking care to only use light pressure. 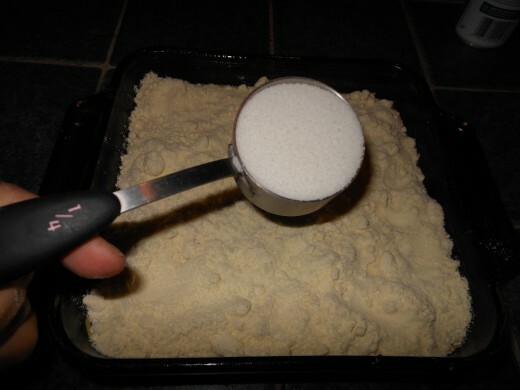 Sprinkle 1/4 cup of sugar over the cake mix. Spread evenly. 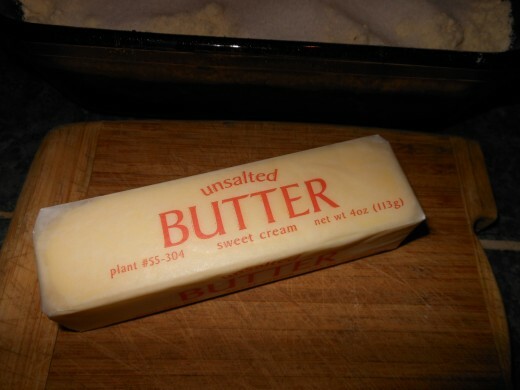 Evenly cover the mixture with thin slices of unsalted butter. Insert the baking dish into the oven and bake until golden brown. Baking times will vary. Usually bakes in 15 - 20 minutes. 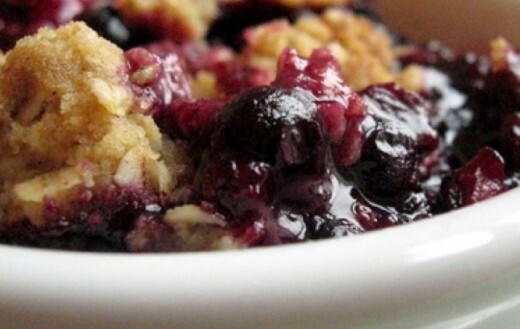 Warm Blueberry Dump Cake tastes fantastic topped with a scoop of good ol' fashion vanilla ice cream. A simple, light and delicious cake that will satisfy your craving for sweetness without all the added calories. 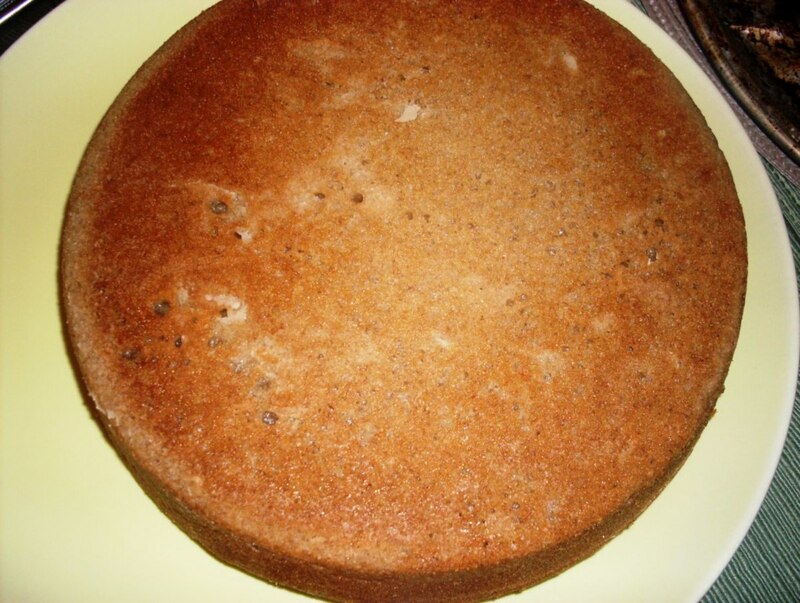 A versatile cake that can be made with blueberries or any other kind of fruit. 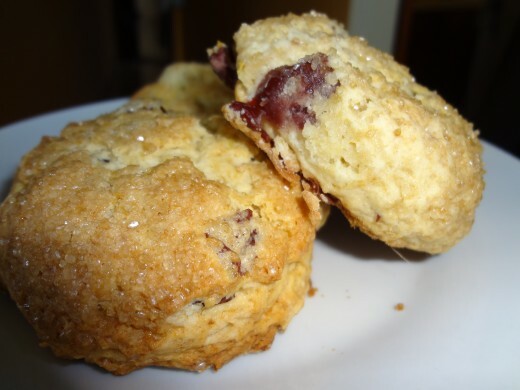 Scones are an often neglected quick bread you can grab for breakfast or a snack. The addition of dried blueberries makes for intense flavor and chewy texture. Blueberries are a wonderful fruit full of vitamins, minerals and antioxidants. Its health benefits are amazingly beneficial. lrc7815, awwww thanks! I really appreciate your great comment. Wish I could send you a slice. Thanks again. I would try this even if I didn't like blueberries simply because you were so creative in the presentation. Great video, great hub! Voted up. rebeccamealey, thank you! 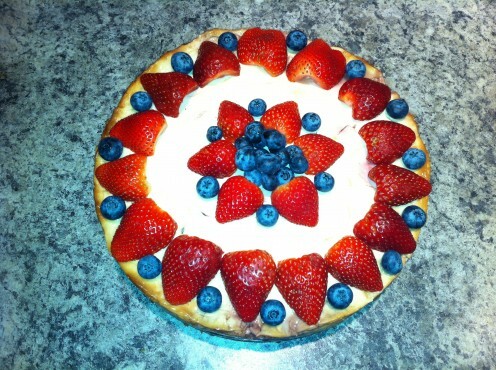 I bet this would taste great with fresh blueberries and I'm sure your adjustments will be perfect - enjoy! Thanks for reading. What a cool cake and a cool video! I think I am going to try it with my fresh blueberries. I may have to do some adjusting, but I'll bet I can make it work. Thanks! homesteadbound, Hi Cindy! There are lots of options for videos and I enjoy playing around with the programs. I'm sure I'll be seeing some wonderful Cindy M. videos soon :) I do hope you like the dump cake - thank you for stopping by. You have got this video stuff down! I want to learn how to do it! This looks so wonderful, I will have to feature this on my blog next week. Thanks so much, MissO! Oh! That is so totally awesome. I am going to try. Thanks so much! Looks delicious! We just picked up a big batch of blueberries, so I might have to give this a try this weekend. Thanks! anglnwu, I'm so happy you loved it. Thank you! asmaiftikhar, Hi Asma! I'm so glad to see you. 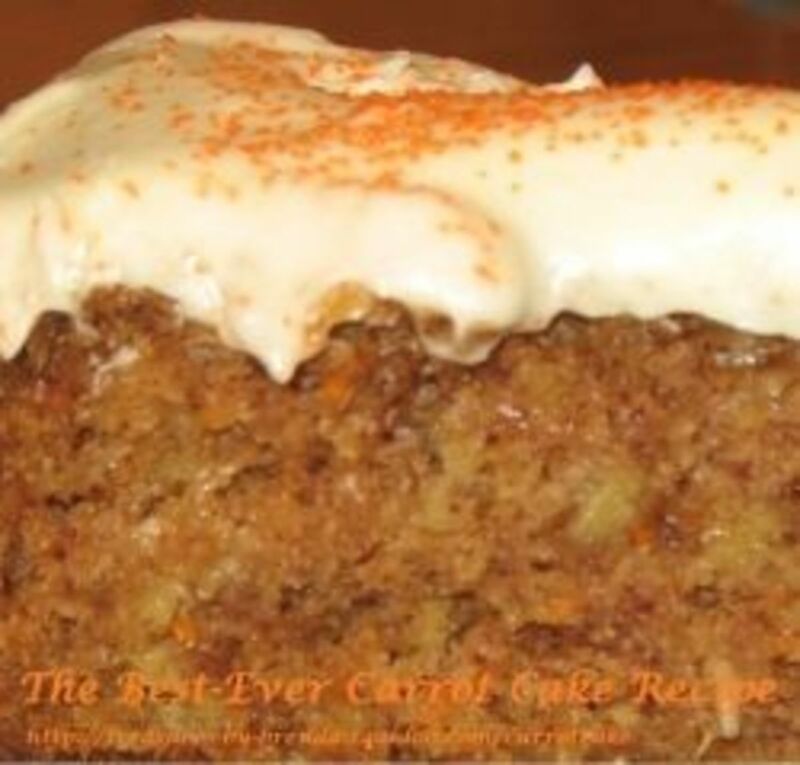 It is a very quick and easy recipe - absolutely delicious. You won't be disappointed. I do hope you give it a try. RealHousewife, Hi Kelly! I think I've had that version of dump cake too. It IS DELICIOUS! You should write a hub about it. Ohhhh and a peach dump cake would be wonderful. Fresh peaches will be coming into season in June - can't wait! That looks gorgeous, beautiful and delicious! 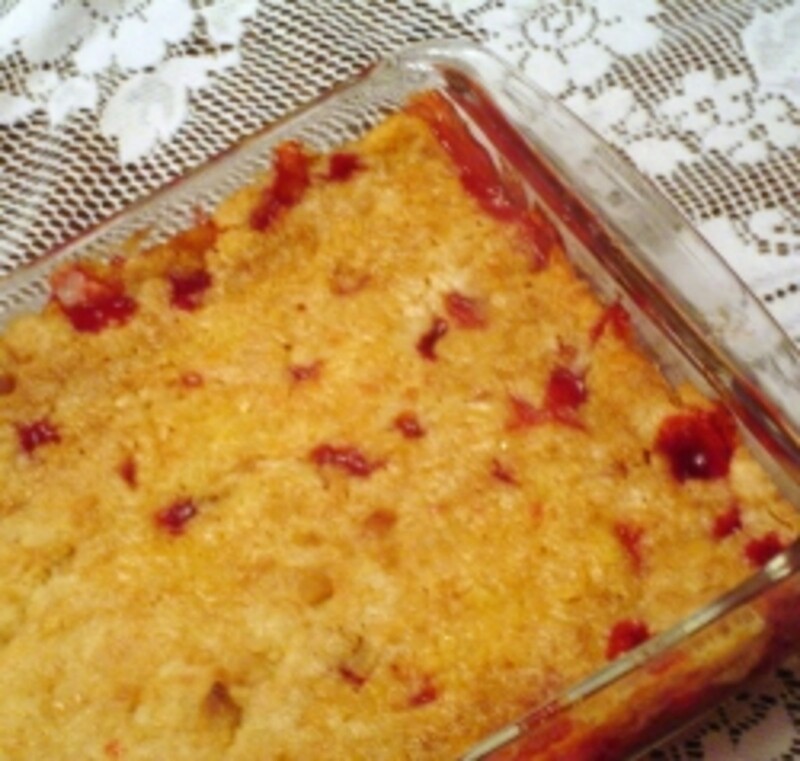 I have made dump cake but I always used a can of cherries and pineapple - then pecans on top...I took it to lots of parties and never anything left! I can't wait to try with blueberries and maybe peaches! Up up up! miss olive that is yummy recipe and the most beautiful aspect is that ,that is not a time taking recipe .thanks a lot for sharing this. Simply Awesome !,, So awesome, and looking so delicious to the point of having to wipe the drool off my chin.. MUST HAVE BLUBERRIES ! ~ Very well done. Love your video. Looks so yummy--got to try. Victoria Lynn, thank you Vicki! 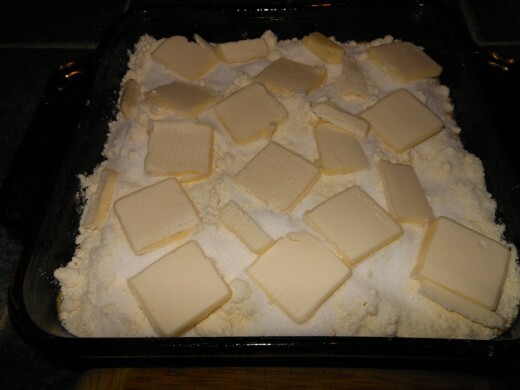 Aren't dump cake recipes fun and easy? I just love them. Anamika, you are quite welcome - glad to share. Thank you for stopping by. Ruchira, I appreciate that. I'm sure you will like this easy recipe. Teresa Coppens, It is delicious and definitely easy. Thanks for the votes. Awesome! That is such a jazzy video. I am a big fan of your dump cake recipies. I will definatley give this a try. Excellent hub! This not only looks delicious but very easy to make. Definitely one to try. Voted up! That one looks awesome! Got to try it! Thank you for sharing the recipe. Yummy, easy recipe! I love dump recipes. Nice looking hub, too!